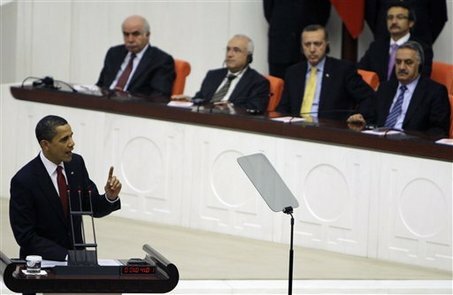 New York Times Columnist Bob Herbert wrote an editorial June 21 titled “When Greatness Slips Away”. It has been reprinted in every major newspaper and has been talked about around the world. We are submitting to this debacle with the same pathetic lack of creativity and helpless mindset that now seems to be the default position of Americans in the 21st century. We have become a nation that is good at destroying things — with wars overseas and mind-bogglingly self- destructive policies here at home — but that has lost sight of how to build and maintain a flourishing society. How is it possible that we would let this happen? We’ve got all kinds of sorry explanations for why we can’t do any of the things we need to do…Meanwhile, the greatness of the United States, which so many have taken for granted for so long, is steadily slipping away. I still believe in America! I still believe in the Spirit of America. But I believe that Spirit is slowly slipping away, and I believe I know why! God has declared his standard of greatness for any nation. Righteousness is the foundation for the Spirit of America, for the Greatness of America. Sadly, we are losing our foundation of righteousness. “America is a place of heroes, honor, achievement, and respect. But it is as well a place where far too often, heroism is confused with celebrity, honor with fame, true achievement with popularity, individual respect with political correctness. From inside here you look out at a culture that celebrates self-gratification, the crossing of all moral boundaries, and now even the breaking of all social taboos. And on top of it all, too often the sound you hear is whining – the whining of America, what can be heard only as the enormous ingratitude of modern man toward our unprecedented prosperity and good fortune. 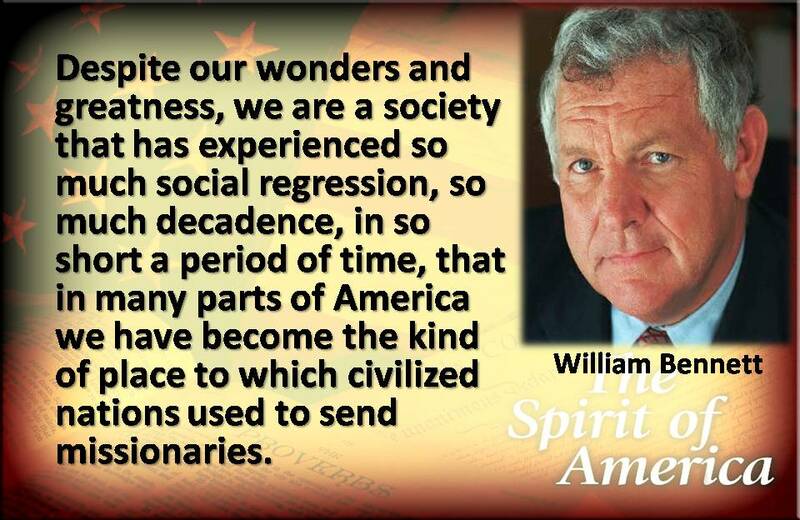 Even in 1997, William Bennett was decrying the growing decadence in America, proclaiming that many parts of America are the kinds of places we used to send missionaries to! 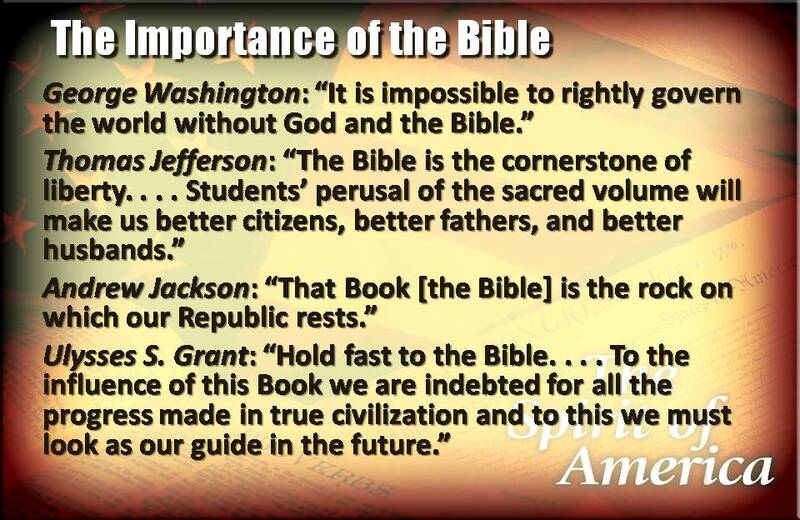 There has been much debate about the religious beliefs of our Founding Fathers. 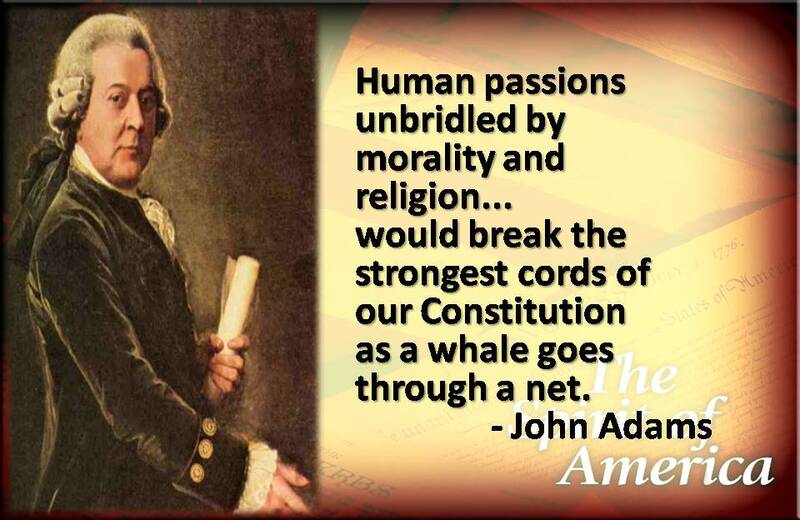 Regardless of what you believe about their religious beliefs, all the writings we have indicate that our founding Father’s knew what “Righteousness” was. They knew what morality and virtue was. They believed that the Bible was the Word of God and that Righteousness and morality and virtue are all defined within its pages. 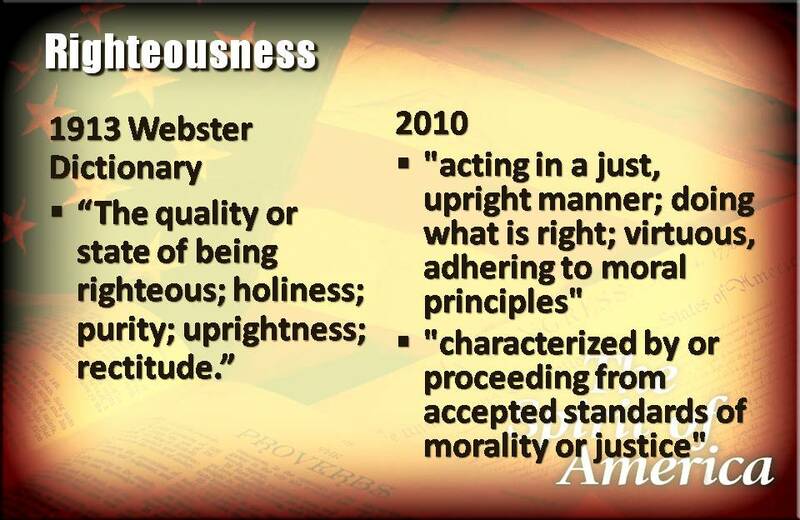 Webster concluded that righteousness is conformity to the divine law, and in short is true religion. Webster considered “education useless without the Bible.” And as a result he utilized God’s written word as a key to the meaning of words. There is a Scripture reference used in most of his definitions. Our founding fathers knew the Scriptures, knew the validity of them, and realized that Creator God was the defining image of Righteousness and Justice. Righteousness was based upon the truth of God and the truth of His Word. God set the definition of Righteousness. JOHN EIDSMOE wrote “Christianity and the Constitution: The Faith of Our Founding Fathers” (Baker Book House, 1987, 2008), and in it he demonstrates that at least 51 of the 55 delegates to the Constitutional Convention were members of Christian churches, and that leading American political figures in the founding era quoted the Bible far more than any other source. 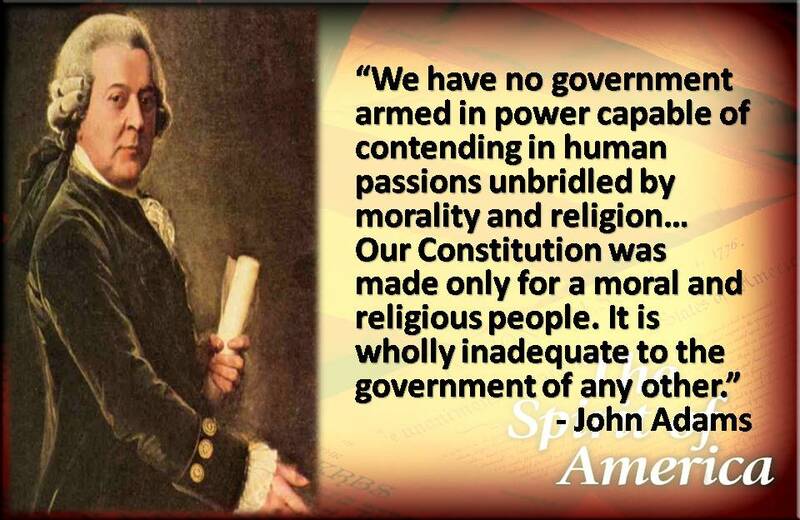 Our government and our Constitution was based upon a people who are moral and religious. Our Constitution was founded upon the principles of Righteousness! 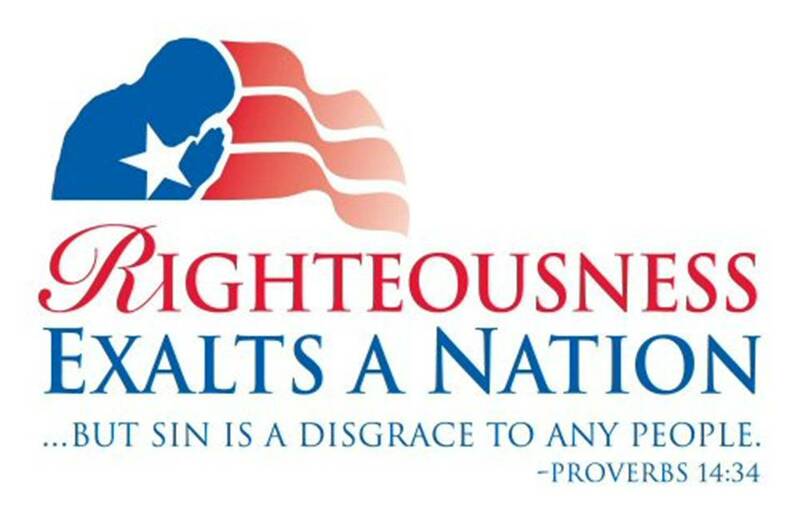 Righteousness exalts a Nation! 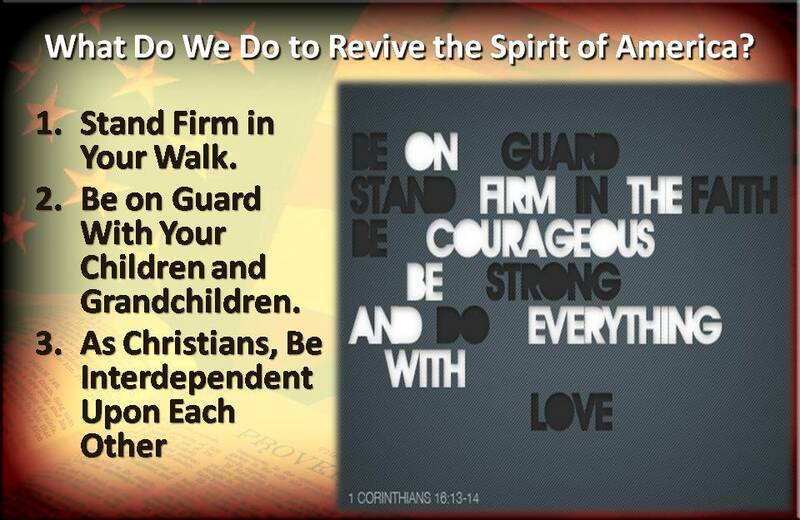 The Spirit of America, the Strength of America is based upon our Righteousness in upholding the Law of God! Something is happening to America! 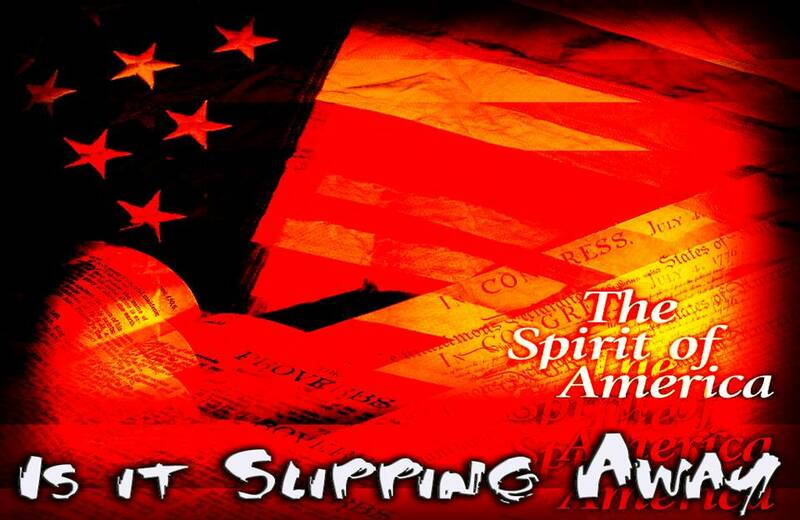 The Spirit of America is slipping away! The greatness of America is slipping away! We have Slipped Away From our foundation of Righteousness! Gone was the basis or foundation of the righteousness-God and His Word. 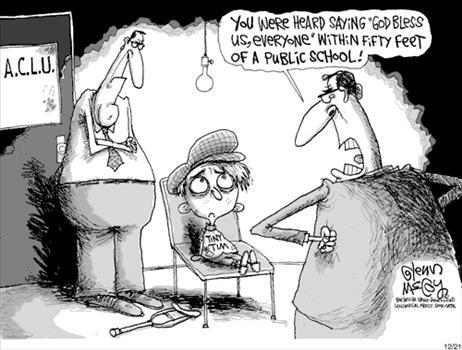 We have taken God out of education, out of politics, and are in the process of taking him out of society. God has come under attack in America, and is being pushed aside. 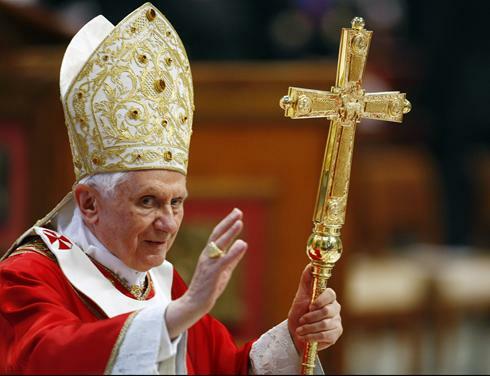 Our society is becoming increasingly secularized, and everything from churches to politics is being affected. We are turning away from the moral foundation of Righteousness which made our nation great! As a result, the Great Spirit of America is slipping away! When we forget God and ignore His Word, the moral fabric that forms the foundation of our Government is seriously weakened. By Secularizing morals and ethics (secularizing means to make profane, to remove the spiritual basis) and by denying God as the source and standard of RIGHTEOUSNESS, we are pushing the American Ideals off the foundation of God’s Word! 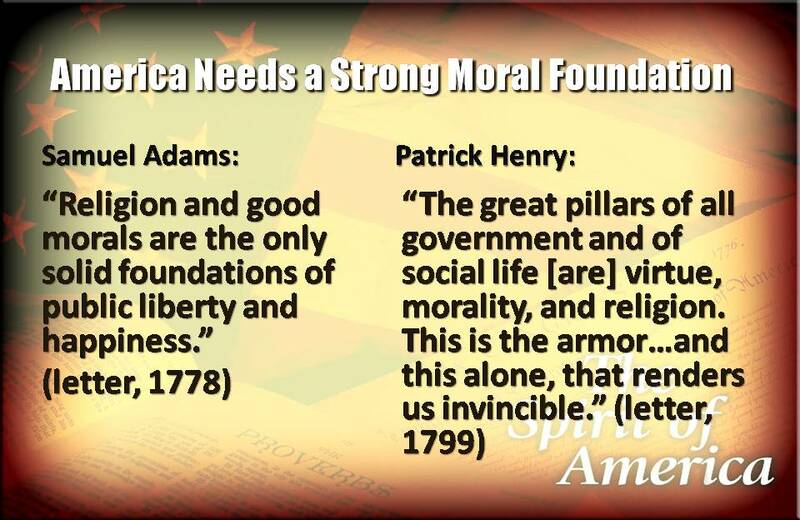 Those Ideals cannot stand without the foundation of God! The American Constitution cannot be secularized without being torn apart! IS THIS THE INTENT OF OUR GOVERNMENT? The Righteousness that is based upon God’s Moral Law is being stripped away from our moral consciousness, and thereby the moral fabric of America is coming unraveled. 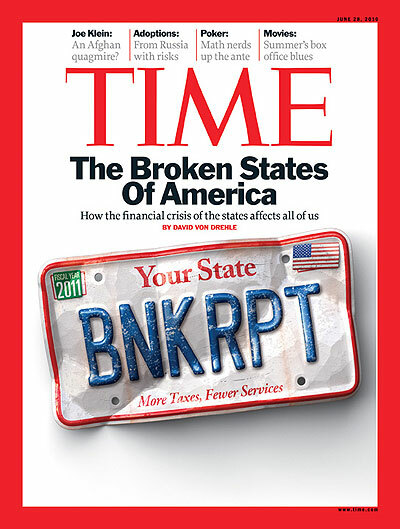 The Stabilization fabric of America is failing. America is starting to yaw (move unsteadily, weave, deviate from a straight course). 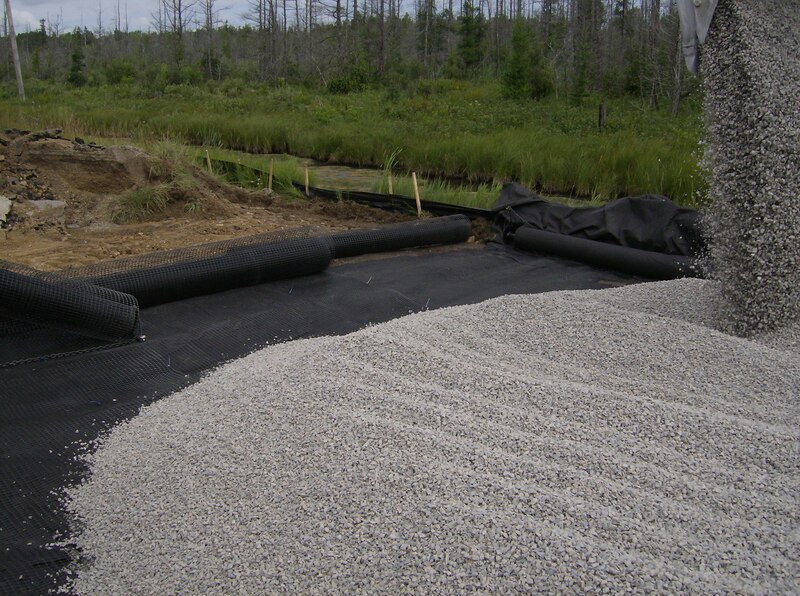 Our subgrade is failing, our Godly foundation is breaking up. America was founded by laws drawn from God’s Holy Law. But we have profaned our laws by removing God’s Moral Standard. We have vitiated our Laws by removing that which made them RIGHTEOUS! We have become a SECULAR NATION! God is being replaced slowly but surely, and we are not even noticing. As God is being replaced, so is the Great American Spirit. 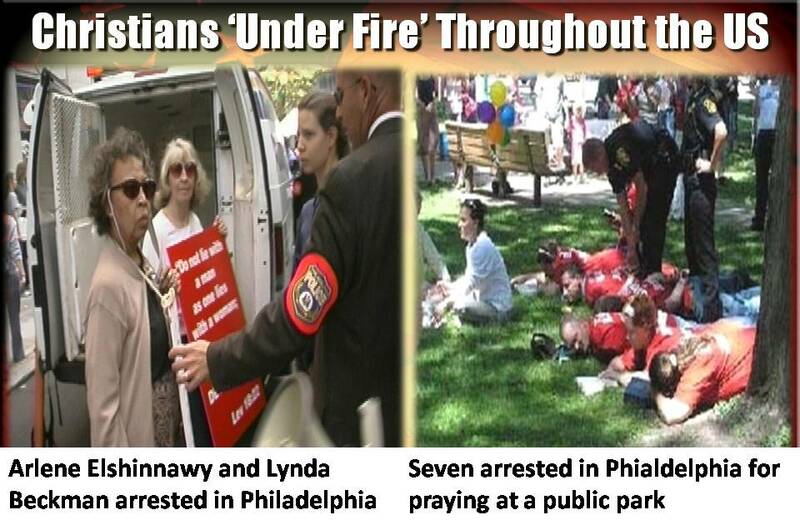 Arlene Elshinnawy, a 75-year-old grandmother of three, and Lynda Beckman, a 70-year-old grandmother of 10 (along with nine others), were arrested for sharing their faith on the public sidewalk in Philadelphia, Pa., USA. The event was the city funded Gay “OUTFEST”. They faced 47 years (the rest of their lives) in jail for spreading the Gospel because of a Pennsylvania “hate crimes” law. A woman in Houston, Texas, was recently ordered by local police to stop handing out gospel tracts to children who knocked on her door during Halloween. Investigating officers told her that such activity is illegal and that she would be arrested if she continued the practice. Police arrested seven Christians in Elmira, N.Y., who prayed on public property while holding their Bibles. The charges? Intent to cause a public disturbance, obstructing foot and vehicle traffic and taking part in any act that serves no legitimate purpose. 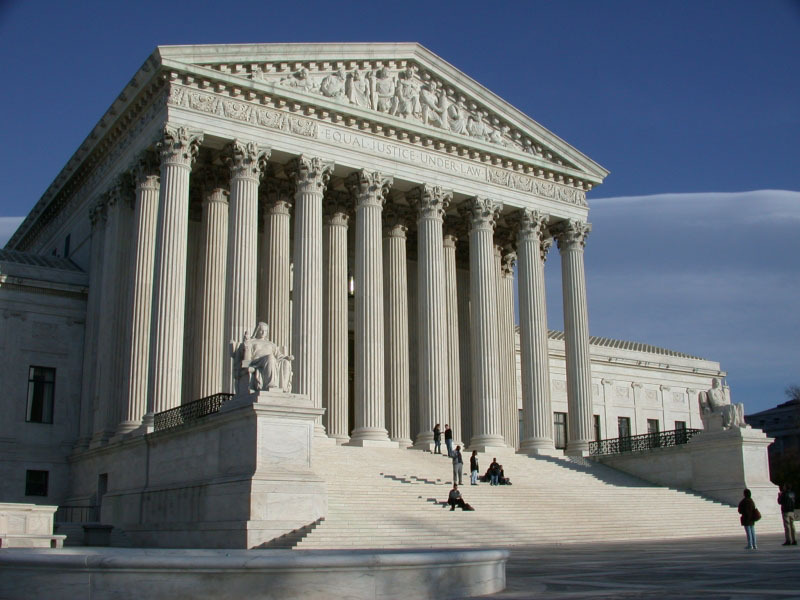 In San Diego, the school district granted a group of Muslim students prayer rights despite the rulings that verbal prayer in public schools has been declared unconstitutional, even if the prayer is both voluntary and denominationally neutral. In a Michigan case, it was declared unconstitutional for a student to pray aloud over his lunch. 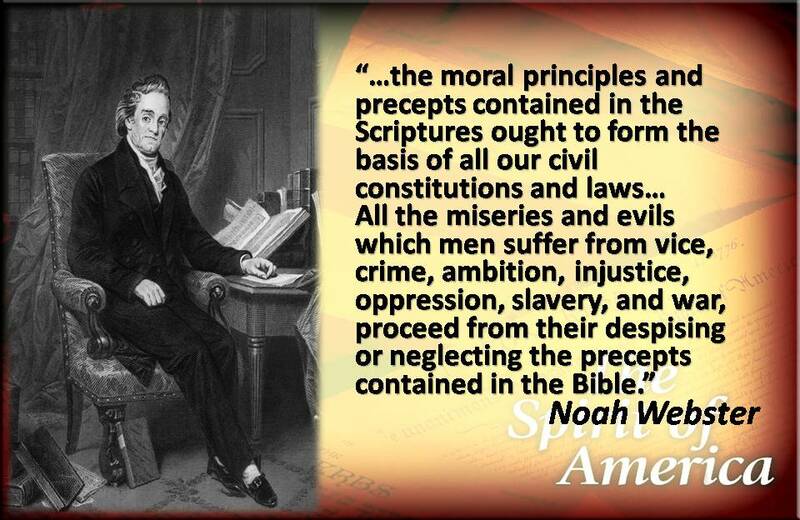 A student in Omaha, Neb., was prohibited from reading his Bible silently during study hall and was further enjoined from opening his Bible at all in school. Sixty-seven year-old Cummings, Ga., resident Fredric Baumann was arrested for passing out gospel tracts on a public street. Convicted and jailed for two days, Baumann was denied his rights to contact a lawyer, and denied the use of his reading glasses. Jim Pullion, a quiet, disabled Christian grandfather would peacefully hold pro-life signs around his community of Owosso, Michigan. But one morning while holding signs in front of his granddaughter’s High School, Jim was viciously shot and killed by Harlan Drake. Drake said he killed Jim because he was upset by his abortion signs. Even though Pouillon’s family extended their forgiveness, Drake remains unrepentant even as he was sentenced to life in prison. April 27, 2010, Julea Ward had the hopes of becoming a certified counselor. With a 3.9 grade point average, she was only a few months away from graduating with a Master’s degree from Eastern Michigan University. 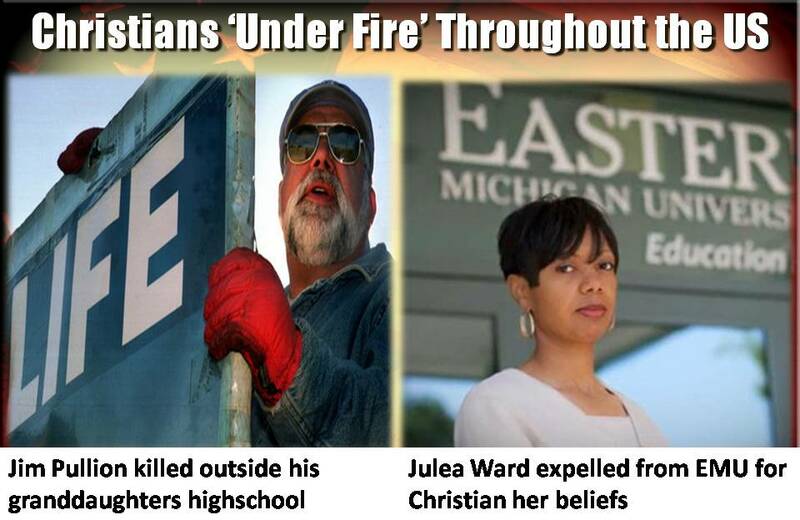 The University expelled Julea from her Master’s program because she refused to engage in activities contrary to her Christian faith. She would not counsel in favor of homosexual lifestyles. When approached by her teacher to counsel someone about their homosexual relationship Julea politely declined and referred the client to another counselor. She was expelled. In Boynton Beach Florida, on February 4th of 2010, two young men (Tite Sufra, 24, and Stephen Ocean, 23)were witnessing to Jeriah Woody (18). They witnessed to Woody for fifteen minutes when he got a phone call and told the preachers he ‘had to go.’ As they walked away, Woody suddenly started walking back toward them. Sufra walked up to greet him and was killed with a shot gun blast at point blank range. When Ocean ran, he was shot in the back. After he fell, Woody shot him in the head execution style. Woody was arrested Wednesday and is charged with two counts of first-degree murder. (Feb 5, Christian News Wire) Jeriah said he had to run a quick errand, left and returned with a pistol. He shot and killed Tite Sufra (24) and Stephen Ocean (23). 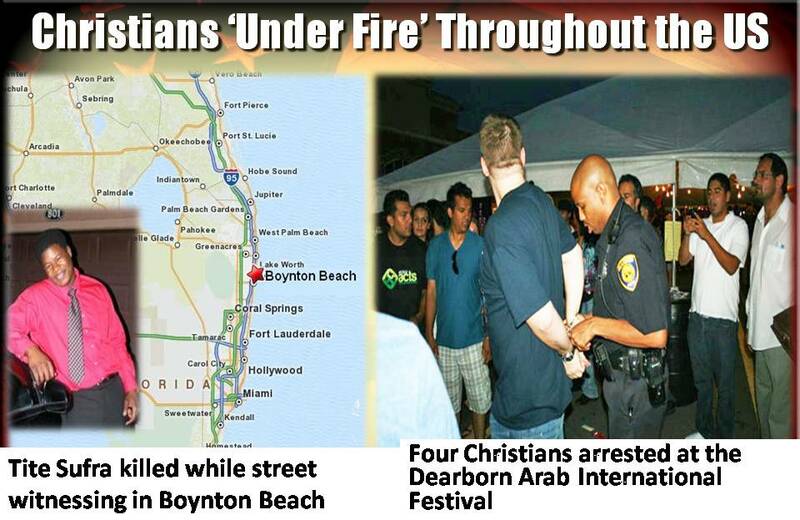 June 19, 2010 DEARBORN, Mich. — Four Christians were arrested for disorderly conduct outside the Dearborn Arab International Festival while handing out copies of the Gospel of John in English and Arabic. Arrested were Negeen Mayel, Dr. Nabeel Qureshi, David Woods, and Paul Rezkalla. Dr. Quereshi is co-director of Acts 17 Apologetics Ministries. He holds an MD from Eastern Virginia Medical School and an MA in Christian apologetics from Biola University. Mayel, an eighteen-year-old female, whose parents emigrated from Afghanistan is a recent convert from Islam to Christianity. “When Dr. Quereshi was arrested I heard people clapping and applauding, and some said ‘Allahu Akbar,’” Atkins said. 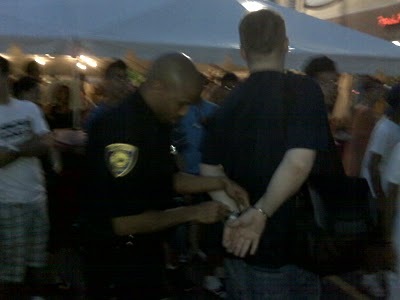 There was a crowd of 15-20 people watching the exchange and subsequent arrest. “I never thought I would see this in America,” says Steven Atkins, a resident of Toronto, Canada, who was visiting the festival and observed the incident. 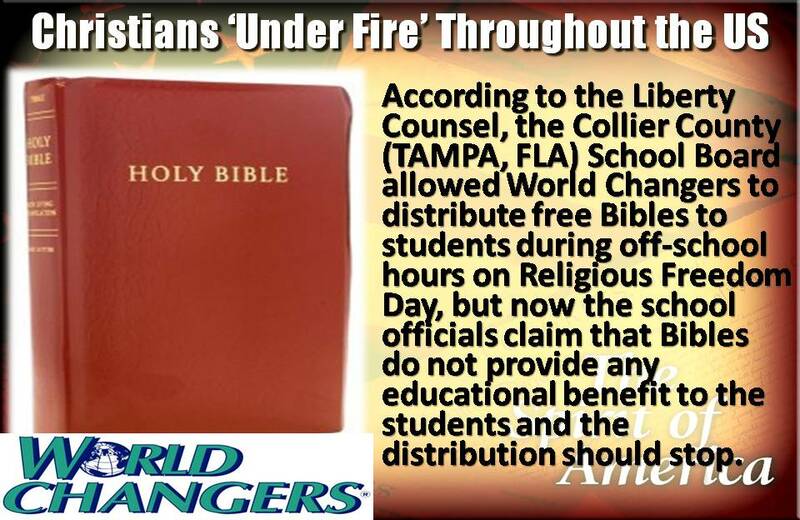 TAMPA, Florida (OneNewsNow) — Earlier this month, World Changers of Florida was denied the right to distribute the Bible in the Collier County (TAMPA) School District during off-school hours. Mat Staver, founder of Liberty Counsel, is handling the case. “This particular school says that everything goes but the Bible is banned,” he adds. According to the Liberty Counsel, the Collier County School Board allowed World Changers to distribute free Bibles to students during off-school hours on Religious Freedom Day, but now the school officials claim that Bibles do not provide any educational benefit to the students and the distribution should stop. We are becoming a society that is not built upon God’s Truth, but based upon the denial of absolute truth, to the end that we accept ANY truth. We are becoming a Nation of “ANYTHING GOES”. We appease everyone and end up pleasing no one, especially our Creator God! Because we have become a Nation of “No Absolute Truth”, we have accepted a multitude of belief’s. We have become a nation of “Any Lie Goes!” Our acceptance of “any truth” and therefore “any lie” has led to something far worse than a “forgetting” or “neglect” of God. It is a dramatic CULTURE SHIFT! 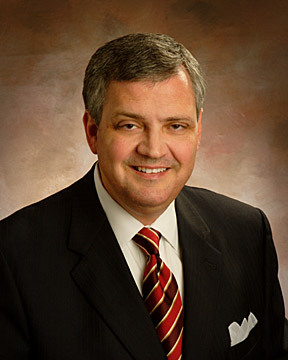 After reading the 2009 American Religious Identification Survey, Albert Mohler, President of Southern Baptist Theological Seminary (our largest Southern Baptist Seminary), which revealed that the number of Americans who claim no religious affiliation has nearly doubled since 1990, rising from 8 to 15 percent and revealed firther that the Pacific Northwest is no longer the leader in people who are religiously unidentified, but is now held by the Northeast Region of America. Strong religious convictions therefore played a role in the development of the United States, which was established on Christian principles and open to all people of good will. Imagine that. A nation whose laws and institutions are based on the teachings of the Redeemer of mankind. Why, such a place would surely become the leader in education, invention, and the arts. Such a place would probably become a haven of religious liberty for more types and religions of people than has ever existed anywhere or at any time on earth. Instead of religious persecution and intolerance, such a place would offer hope and opportunity to the huddled masses of the earth. For we would do so not only at our own peril, but our own ruination. I love America. I want to see us remain a Great Nation. What can we do to turn the tide? What can we do to stand in the Gap? What can we do to see the American Spirit thrive again? 1. Stand Firm in Your Walk. Constantly Check it out: Has your Christian walk become secularized? Have you secularized Christian Observances like Easter and Christmas? Do your children and grandchildren know what those holidays are really about? Examine your heart toward your church! Do you enter with the reverence of God on your heart? Examine your life through the week. Are you living as a child of God, are you reading and depending upon God’s Word? Are has your life become secularized, profane, and God rendered ineffective by your constant neglect of Him in your daily life. 2. Be On Guard With Your Children And Grandchildren. Become familiar with what they are learning. Examine their textbooks. Point out errors. Acquaint your children and grandchildren with the real foundation of this country. Work to counter the lies of the educational system. Become a proponent of Creator God. 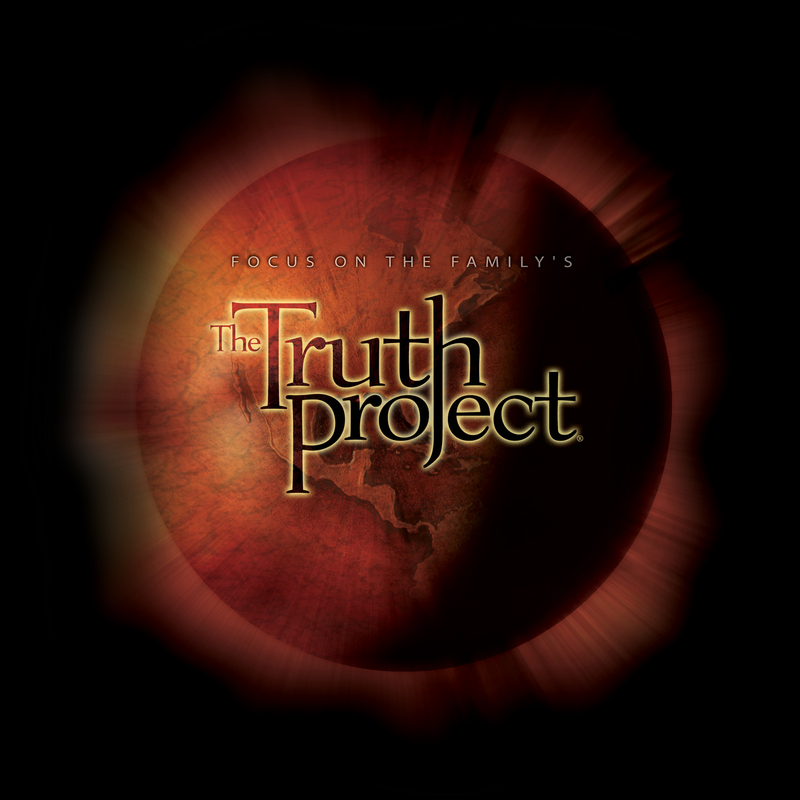 Let your children and grandchildren know who really made them, and how he created this world. Let them know how evolution could never explain the intricacies of how wonderfully we are made. Be Courageous and Strong! Together! We are not facing this struggle alone. We gain boldness when we join with other Christians. We unite in a common cause of making Jesus Christ known. We pursue the liberty and freedom that is in Him! And we do it united with likeminded Christians in a solid, Bible believing, Bible teaching church. We are to be the light of this Nation! We can only do so as we bind together and guide this blind nation to God’s Word once again. We do so through our lives of sincere love and compassion. We are to be the living reality of God’s Word! They got married within two months, and embarked on an active life as a team! They are successful building contractors, they have three sons, they sail, fish, bodysurf, and even golf. 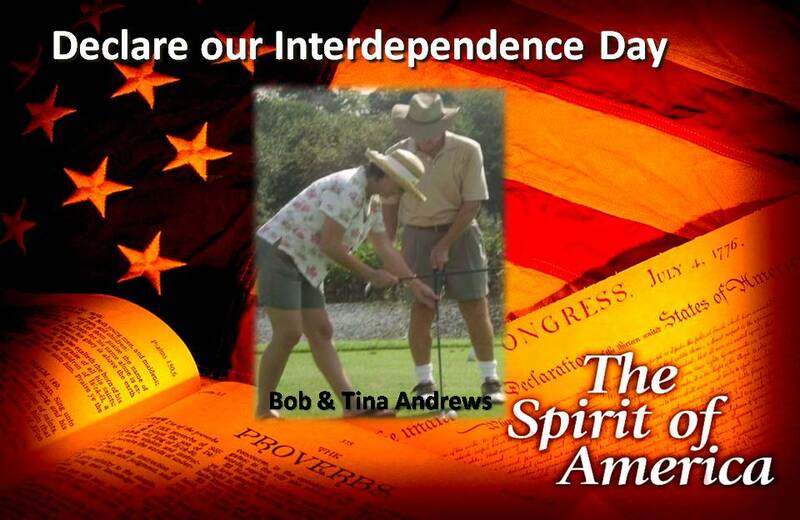 Last year Bob even became the 2009 United States Blind Golf Association’s (USBGA) national champion. What is the secret to this couple’s success? Every blind person is told at first that he’s going to be dependent on others his whole life, and so they react wildly. They walk into traffic, take up dangerous sports, stuff like that, stuff that will prove to the world that they don’t need them. But it only makes them unhappier. Eventually, through love, they recognize that the only way to be happy and at peace is to live interdependently, to live knowing they need others and others need them. 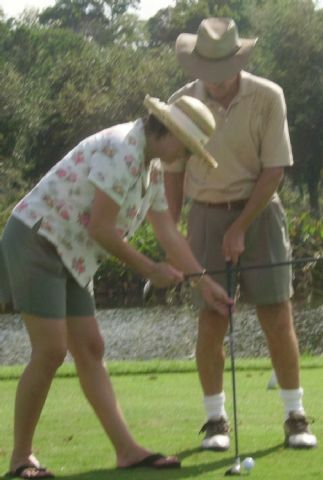 That’s what blind golf is, a symbol of that lesson. The notion that we all need each other, blind or sighted. America is made up of many, many different people, with many different ideas. God is counting on the Christians, His people to work with each other in guiding this blind nation. We can’t isolate ourselves and hope the problem goes away. No, we must unite with other Bible Believers and together, through love and faithful witness, we can see the Sprit of America restored. When we fail to see our dependence upon each other, fail to work together for the cause of Jesus Christ, we are giving in to the secular powers that want to remove God from our Nation. We celebrate July 4th as our Independence Day. Yet our independence will lead to the loss of the Great American Spirit. We need to declare July 4th our Interdependence Day and work as a team to restore the Righteousness of God in our Nation! It begins with our lives!